Looking around, I see is that we DO have our spirit back. Koshkonâ is a Michif word that describes awakening. Our people know who we are and where we come from. Koshkonâ is our celebration. The future is now and we proudly wear our colours. ***Please check the size chart carefully. The nature of made to order clothing means that the garment is made just for you, in the size you ordered. It’s important that you take the time to take your true measurements and refer to the size chart to avoid disappointment. I am unable to offer refunds or exchanges, for any reason. A full circle wrap skirt to fit a beautiful range of body types! Made of the most popular peachskin jersey, this skirt is as comfortable to wear as it is stylish. The skirt wraps around and ties to comfortably fit 22" to 42" waist size. Outstretched, the skirt measures 52". One size. Plum leggings with black beadwork print panels and a super cute "cummerbund" detailed waist! 88% polyester, 12% spandex performance wear. Made in Canada and sewn by hand. Good for active wear or dressing up. Compression fit means they hug in all the right places to suit your unique and beautiful body type. Easy to care vivid print that will never fade after washing. EcoPoly fiber is considered eco-friendly since it requires significantly less energy and water use during manufacturing. **Please check size chart carefully. Art to Wear garments are made to order. They cannot be returned or exchanged. If your measurements are between sizes (or close), order up one size as leggings do fit tight. The nature of made to order clothing means that the garment is made just for you, in the size you ordered. I am unable to offer refunds or exchanges, for any reason. Plum with black beadwork print details! 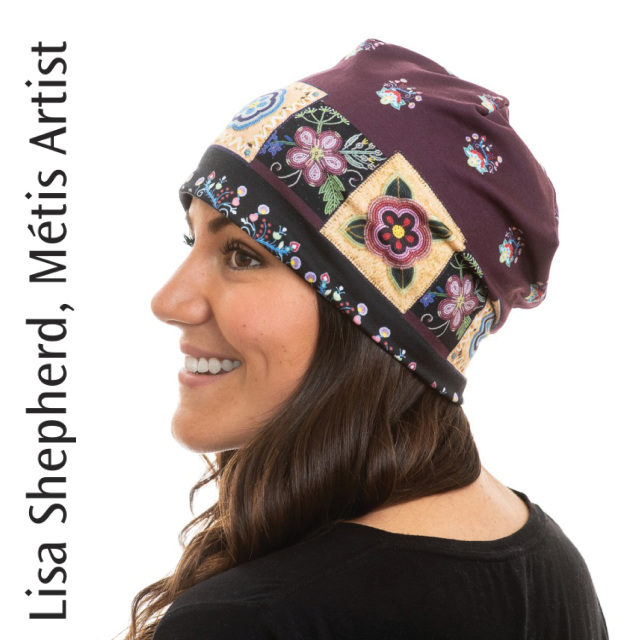 mPlum with bead print shows forget-me-not, kinnikinnik and Métis rose! The shell (outer) layer is a spun polyester fabric. It wears great and is highly pill resistant so can be worn and washed with almost no noticeable change to the fabric surface. Lining in sustainable bamboo/spandex knit perfect for indoors or mild weather. Easy to care for. Wash it in a washing machine in cold water, or hand wash in cold water. Air dry. Kîciyimitowin is the Michif word for honour. When this long scarf is worn, it is to honour all our Veterans; the men and women of the past and today who have selflessly given of themselves. Only to Bead with You is a fun tank for those who would scale city walls to find their beading group! Kîciyimitowin is the Michif word for honour. 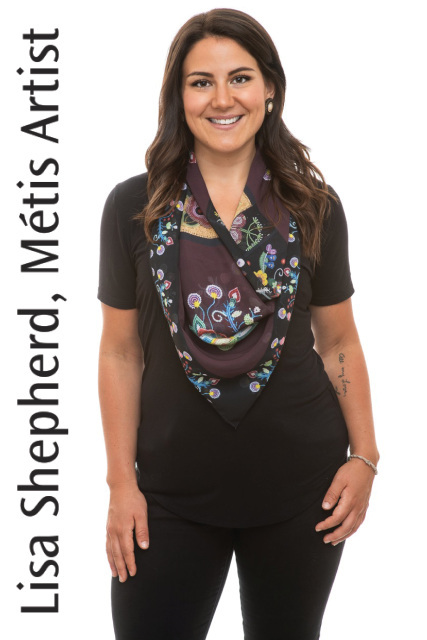 When this scarf is worn, it is to honour all our Veterans; the men and women of the past and today who have selflesslygiven of themselves. 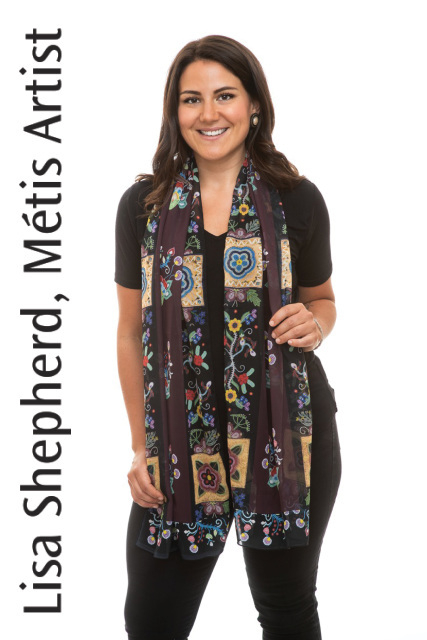 This elegant scarf shows a print of traditional beadwork of poppies, forget-me-nots and dragonflies gracefully wrapping around the Métis infinity symbol. For the beading fanatics and those they stitch with. Gather together, put on some tea and let those beading needles fly - there's stories that need telling! Soft peachskin jersey is 92% polyester and 8% spandex. **Please check size chart carefully. Art to Wear garments are made to order. They cannot be returned or exchanged. If your measurements are between sizes (or close), order up one size. The nature of made to order clothing means that the garment is made just for you, in the size you ordered. I am unable to offer refunds or exchanges, for any reason. This playful line of Art to Wear takes you from the gym to a summer picnic, in the pretty serenity of wild roses against a big prairie sky. The Humble Sack transforms from a bag to a picnic throw and even to a halter top. The yoga shorts and crop top are sporty and feminine and perfect dance wear. Naturally quick-dry and wicks moisture away as you workout. Vibrant print not fade with washing or wear. *For in between measurements, always choose the larger size. Wear your yoga short to the beach, dance/yoga studio, or to lounge around-the-house under the jersey cover-up. 88% polyester 12% spandex performance wear manufactured in Canada. Print will not fade with washing or wear. The pretty floral print flows from the left shoulder to the right hip, in a "sash-like" fashion. When you pair this top with the Wild Rose Blue Sky skirt, the floral line will continue to the right side hem. 88% polyester, 12% spandex performance wear. Made in Canada and sewn by hand. Good for active wear or dressing up. Compression fit means they hug in all the right places to suit your unique and beautiful body type. Easy to care vivid print that will never fade after washing. Thick elastic waistband finishing and cover stitched hems. EcoPoly fiber is considered eco-friendly since it requires significantly less energy and water use during manufacturing. **Please check size chart carefully. Art to Wear garments are made to order. They cannot be returned or exchanged. If your measurements are between sizes (or close), order up one size as capris do fit tight. The nature of made to order clothing means that the garment is made just for you, in the size you ordered. I am unable to offer refunds or exchanges, for any reason. Gather up your summer picnic or yoga essentials into the body of the sack, pull the corners through the loops of the strap and mosey on down the tracks. When get to where you're going, open up your sack and spread out the fabric to set out your picnic, do your downward facing dog, or simply lie on to read a book. The square of fabric can tie as a shawl around your shoulders on a breezy summer's eve, be worn as a scarf to add a splash of colour to your outfit,or around your neck and waist for a cute summer halter. 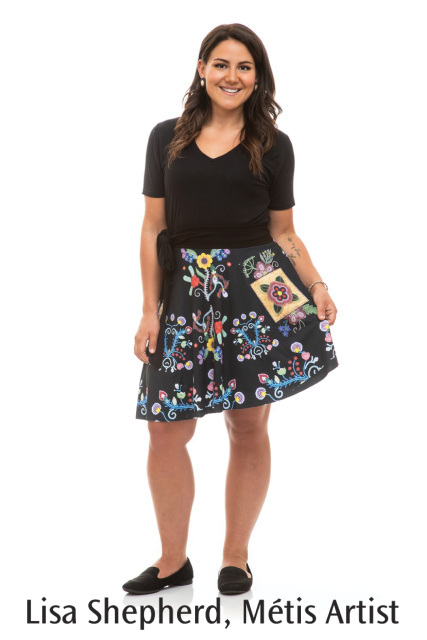 When you pair this skirt with the Wild Rose Blue Sky tank top, the floral design will flow from the left shoulder to the right side hem in a "sash-like" cascade! The skirt is sporty and versatile for so many fashion looks. 88% polyester 12% spandex performance wear fabric manufactured in Canada. The flared skirt falls mid-thigh on most people. Check the measurement chart for accurate length measurments. High waist, with thick elastic waistband finishing for comfort. Pretty print will not fade after washing or wear. Made with EcoPoly,a production process that uses significantly less water than other polyester production processes. Find out more. Machine or hand wash your skirt in cold water. Tumble dry on regular or hang to dry. Summer wedding? Evening barbecue?This fringed wrap dresses up the flared dress in romantic style. Or, for a bit of bohemian fun throw it on top of a pair Wild Rose capris. It's so versatile that it can even be worn as a stylish beach cover-up. This is not your kookum's bathrobe! Soft and feminine in a peach skin jersey, the cover-up wrap can be worn to lounge around-the-house, over the crop top and yoga shorts or to the beach as a swimsuit cover. Wild Roses and tiny white petaled flowers cascade "sash-like" from the left shoulder to the right side hem. This a-line dress can be paired with the fringed wrap for a romantic and elegant look for a summer wedding. Worn by itself, the dress is sporty and fun and just right for a summer barbecue or day to day wear. Style Tip: The Wild Rose Blue Sky Dress is an hour glass cut and may not suit all body types. If your body type is not hour glass, an alternative suggestion is to pair the Wild Rose Blue Sky Skirt and Tank Top. Print will not fade after washing or wear. Made with EcoPoly, a production process that uses a third less energy and water than typical polyester production processes. Machine wash cold. Tumble dry on regular or hang to dry. Fabric is naturally quickdry so you won't have to wait long before wearing again! *Fringed wrap and headband are not included. Please order separately. © 2017 LISA SHEPHERD. ALL RIGHTS RESERVED.